Whether you're into watching birds or just like a water feature in your yard create an oasis in your garden. Birds singing is one of the sweetness musical sounds in nature, is your sanctuary missing the songs of birds. Install a birdbath to give the birds something to sing about. A classic way to bring a decorative touch to your yard, garden, and attract birds by adding a birdbath. 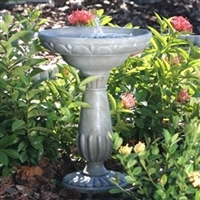 The most common bird bath is the pedestal style made of cast stone, ceramic, resin, or metal. 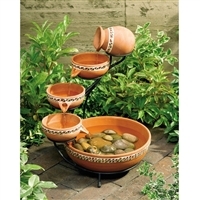 Also, a great selection of tiered styled, hanging, and deck-mounted bird baths. Locate your bath in an area to enjoy the activity, and if a fountain style will need electric or solar, power source. These modern designs feature a self-contained unit that recirculates the water using solar power, so you don't need to hook it up to a hose or extension cord Solar birdbaths come in many styles including pedestal, tiered and ground designs. 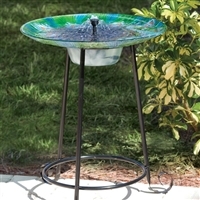 Keep your feathered friends in your yard all winter long with a heated birdbath. 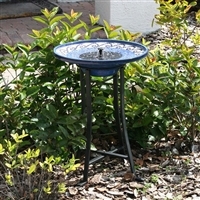 Delightful on your deck or patio and provides fresh water for the birds. Trickling water will attract birds to your fountain and love the retreat you created. Change the water often to keep birds coming back. Fountain bird baths stay fresher a little longer because of the circulating water, the flowing water attracts the birds, creates a soothing trickle and reduces algae and mosquitos. Add song to your outdoor setting for a relaxing and peaceful environment. Turn your backyard into a haven for these singing creatures who add so much joy to an outdoor setting. And don't forget the artistic aspect bird baths can bring! Hand-painted pottery with glazed interior bowls makes cleaning easier and a beautiful addition to your garden or patio. Ceramic baths are easy to clean and can withstand extremely cold temperatures and can add color and style to your outdoor areas. Or maybe you prefer nature portrayed in sculpture art, in which case clay and iron-molded bird baths are for you. Durable bird baths effectively add a grand nature depiction in both the city and countryside. 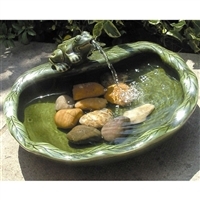 So get a birdbath and watch the birds splash and sing in your backyard.